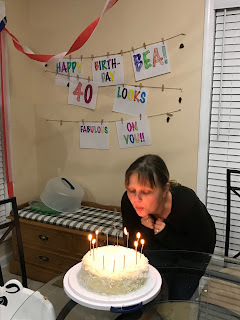 Saturday I had a birthday, the BIG 4.0!! I had kind of planned to have a party, but waited until after my trip, then because of the snow and honestly the trip beat me up emotionally. I didn’t feel like much planning. I think it was Thursday that our friend Gwen from Singapore (her for a month at DUKE) asked me if she could come over for the weekend and she’d watch the kids Saturday while Dan and I went out for dinner. So there went the plan of having people over! But then Saturday or maybe it was Friday I starting thinking that maybe some friends could come over Saturday for dessert and wine or something like that, so I asked my friend Laura and at first she said FUN but had to check with hubby..
since we were close to costco, I decided to get another cheesecake there just in case. And I had also asked another couple from church to come over, I had kind of hinted at a party earlier in the week while I was in DK, but they turned me down and said they had plans- I knew it was short warning to invite them that morning, so oh well, another time.. I meant to invite my neighbors too…. 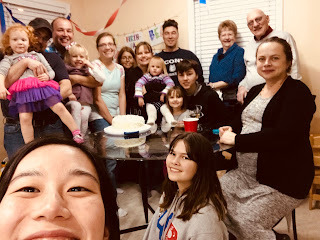 So Gwen came back home with me and soon it was almost dinner time, I had a frozen lasagna we popped in the oven for her and the kiddos and Dan and I went out for sushi! Just before that Laura texted that now her husband wanted her to help her with something, so they couldn’t come over that evening, but maybe her and I could go out another time. Ok NP (meanwhile I’m thinking- jerk- we’re best friends and I’m turning 40!) 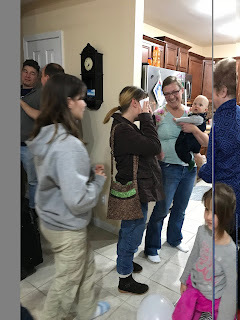 she did say she had a present for me, so to stop by on the way home and I also had her carry on luggage I had borrowed so I put that in the car too. We had a great sushi dinner BTW! and drove home, Dan almost forgot to turn into their street and in their driveway I saw a truck and wondered who it was, but whatever THAT must have been the excuse why they couldn’t come…. So I walked in… and guess WHAT? 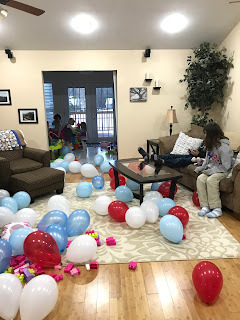 I saw balloons on the floor then my kids jumped out and said surprise! and the house was filled with people- ALL the people that blew me off! Dan was in on it, the whole time!! So fun. I knew you had to have some beautiful nice friends. And you really deserve this surprise after your trip to DK. Have a great week. I'm working on something Valentine. Lordy, Lordy, Bea turned 40! Happy 40th. Looks like it was a wonderful birthday. Happy Birthday!🎉 🎈. So glad you had a nice 40th, you deserve it! Happy Happy Birthday! Hubby thru me a surprise party (long distance, since he was 660 miles away) for my 40th. I'll be 55 early in Feb. I bet those cheesecakes were great! What a fun surprise - you have sweet friends!